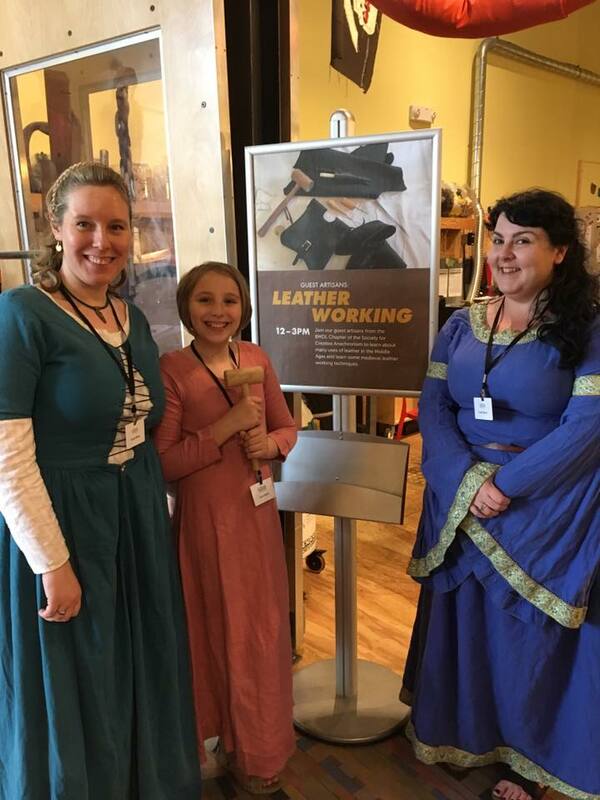 Lady Luceta Di Cosimo reported the following: On June 4th, the Barony Marche of the Debatable Lands conducted another medieval skills demo at the Children’s Museum of Pittsburgh. 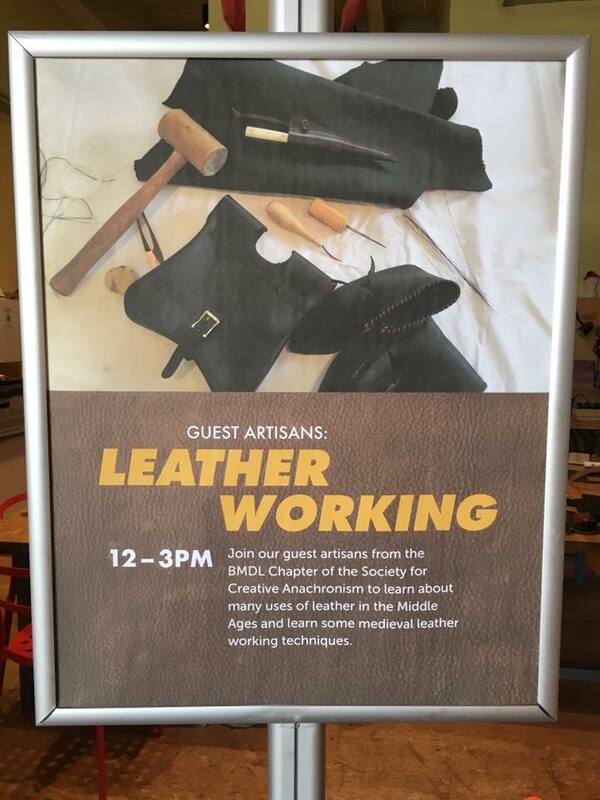 This time the museum asked the members of the Barony to do a demo on medieval leatherworking. 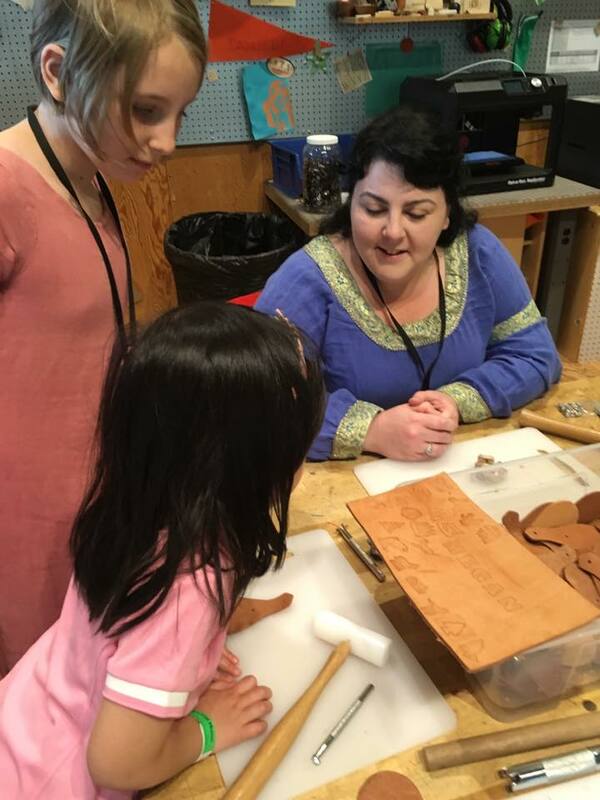 So, once again we were invited to the MAKESHOP which is a partnership between the Children’s Museum of Pittsburgh, Carnegie Mellon’s Entertainment Technology Center (ETC) and the University of Pittsburgh Center for Learning in Out-of-School Environments (UPCLOSE). It is a space dedicated to making, reusing and designing things, using everyday materials and real tools. It has regular programs and special guests. Readers may recall that the Barony did a weaving workshop there a few months ago. 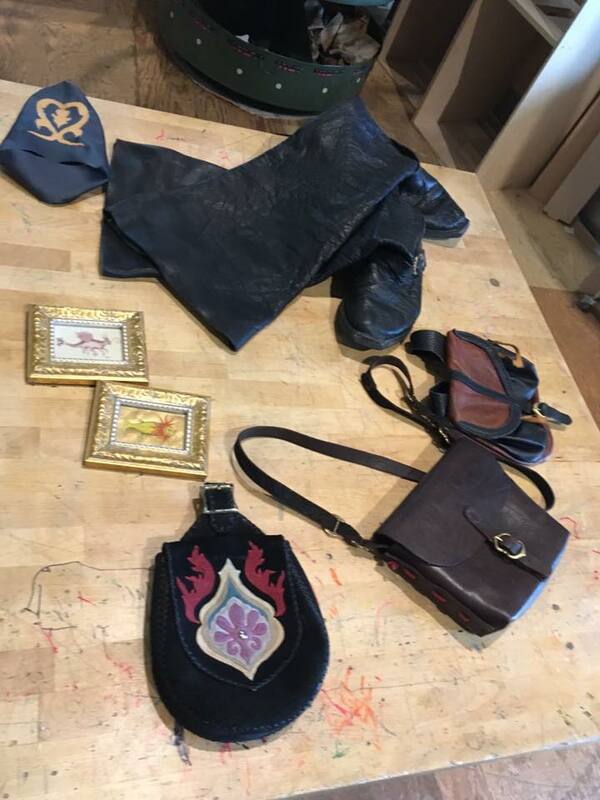 Leather items display, including a Turkish shoe and pouch, men’s boots and pouch, small messenger bag, and miniatures on parchment. In addition to the display, THL Sumayya put together a make and take activity. 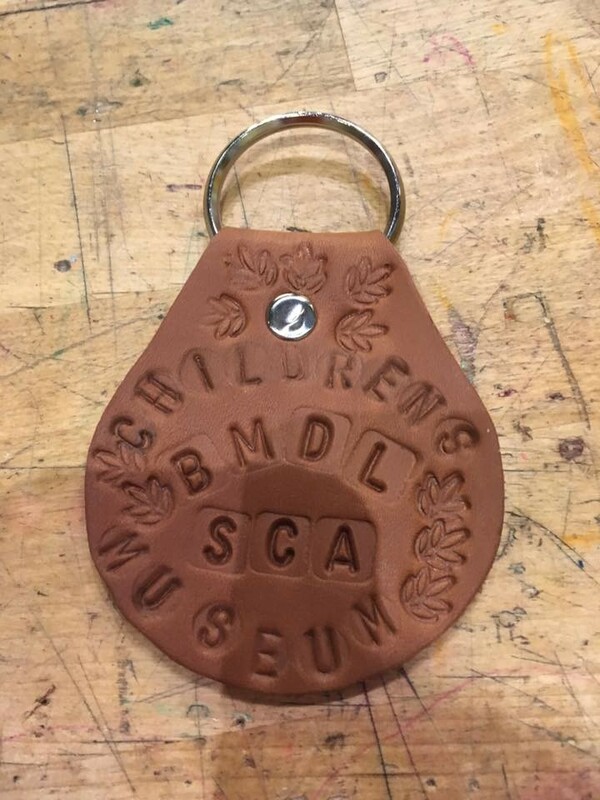 In period, tooled leather was primarily carved, but to make sure even the littlest visitors could safely participate, we had children and their adults make stamped leather key fobs, even though stamped leather was less common in period. We had a number of stamps available, and the Museum loaned their own sets of leather punches. The kids came up with many really neat designs, and many key fobs were made as father’s day gifts. We had dozens and dozens of people come through the MAKESHOP that day, and even after the demo was officially over, we still had people working on their key fobs. Overall we probably had about 150 people visit the MAKESHOP that day. It was a pleasure to be back at the WORKSHOP. The Children’s Museum is a wonderful resource for local families. It promotes a “play with real stuff” philosophy, which is dedicated to inspire curiosity and creativity in kids and allows them to learn through play. We are very proud to be a part of this experience. The Society is full of talented and skilled people, who do amazing and rare and beautiful things, and we are glad to share these skills and knowledge with our Museum neighbors.